Do you feel like the time has come for you to go see the world and enjoy all the beauty and excitement that Mother Earth has to offer? Why not try surfing in the North African country of Morocco? Lucky for you, Morocco Surf Journey is offering a trip for you to do exactly that - ride the Moroccan waves and take in the picturesque allure of its nature as well as culture. If you want, the option to visit several places to further complement your trip is made available for you. Get ready to make friends, have fun, and create lasting memories! Stay in a traditional Berbere family house and enhance your Moroccan experience. A beautiful house with well-equipped, modern kitchen, a number of guest rooms, and well-decorated bathrooms, it has all the home comforts you need. It also has a traditional Berbere salon, which is the perfect place to chill out after a long day at the beach. The rooftop terrace is a great place to eat and relax, and watch the beautiful African sunsets. Stay for four nights in a traditional Berber family house, and learn to surf with Moroccan Surf Journey! 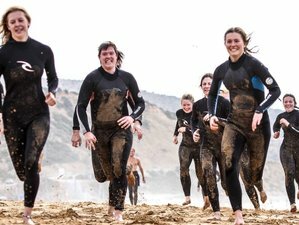 Suitable for beginner or intermediate surfers, you’ll have three days of surf coaching with their experienced instructor and board and wetsuit hire for the week, giving you everything you need for a great week of surfing. With a delicious breakfast, on-the-beach lunch, and homemade dinners all included, they will make sure you don’t go hungry. Additionally, if you feel like delving into Moroccan traditions, you can also get involved in cooking classes to learn the local dishes that they make and improve your knowledge of the Arabic and Berber languages. You’ll also get to enjoy rooftop activities like a barbecue and bonfire, and plenty of time to hang out with other guests, as well as a surf movie night with one of their favorite films. Moroccan Surf Journey’s team will be on hand all week to help you and impart their Berber knowledge on you! The free Wi-Fi in the house will make your life a little easier too, so you can keep in touch with things at home if you’d like to. Of course, they’ll pick you up from the airport and take you back there when it’s time to leave. There’s also the opportunity to do extra trips such as Essaouira and Paradise Valley, or other activities like hammam or sand-boarding. With everything sorted for you, they hope to make your time with them as enjoyable and relaxing as possible! Ismail, a surf instructor and Moroccan Surf Journey's founder, is always around to make sure people get the most out of their time in Morocco. As a certified instructor with the ISA and experience teaching with the Association Surf Academy, his experience with surfing, teaching, and the local area is extensive. With his cheeky smile, fun-loving nature, and passion for getting people the best waves, Ismail will make your holiday an unforgettable experience. Having grown up in the local area, Ismail learned to surf at a young age and decided to dedicate his time to help people learn surfing. Set in the small beach-side town of Tamraght, Morocco, you’re close to so many amazing surf spots and beaches. With the mountains behind you and the ocean in front, you couldn’t ask for a better place to spend a week. There are some lovely cafes in the village and a few shops to buy some supplies if you need to. The village has an easy-going vibe and is full of like-minded that are happy to chill and take in the scenery! During the stay, guests are provided with healthy and tasty meals (homemade breakfast, lunch, and dinner). In the morning, guests will enjoy the delicious breakfast variety with fresh coffee, Moroccan mint-tea, fresh juices, and other various food. For lunch, guests will have a tasty salad, pasta, or sandwich by the beach. Not to mention the three-course meal at dinner time, which is the highlight of the entire day. Moroccan Surf Journey creates fresh and delicious meals with local products seven days a week. Please book your flight to arrive at Agadir-Al Massira Airport (AGA). Transfer from and to the airport is included. Moroccan Surf Journey will pick you up from the airport. You can also choose to arrive at Marrakesh Menara Airport (RAK) or Essaouira-Mogador Airport (ESU). The transfer for Marrakesh Menara Airport (RAK) will cost 1,200 MAD while Essaouira-Mogador Airport (ESU) will cost 1,200 MAD. From Agadir, you can travel by bus from Place Assalam Bus Stop - Rue de Fes. Take the bus number 33 and 32. The price is 5.5 MAD for one way. From Essaouira, the bus passes by Tamraght on the way to Agadir. Ask the driver if he can stop. From Agadir, you can take a shared taxi from Place Assalam Bus Stop - Rue de Fes for 15 MAD per person. Moroccan Surf Journey offers unique and memorable surf trips, inviting you to be a part of a traditional Moroccan Berber family experience.